Okay. So let's avoid all the flowery ho-hum and get right down to business, people. These cookies are A-MAZ-ING. 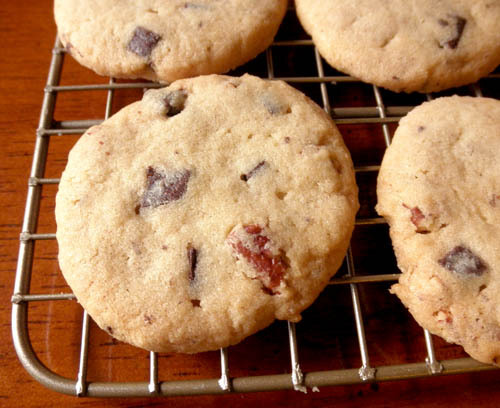 They are so good, in fact, that I just might call them The Greatest Chocolate Chip Cookies Ever to be Invented by Man. Actually, I just decided - I will call them that. 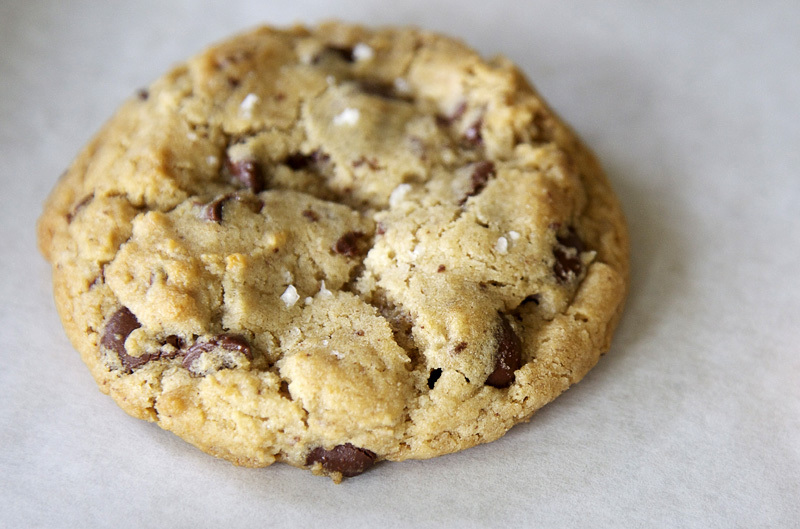 Here, before your lucky little eyes, you see The Greatest Chocolate Chip Cookies Ever to be Invented by Man. I know that's saying a lot. But seriously, you have to try these. Everyone's got their favorite. These are mine. 2. They're crispy and a little crunchy on the edges. 3. They're gooey and chewy in the middle. 4. 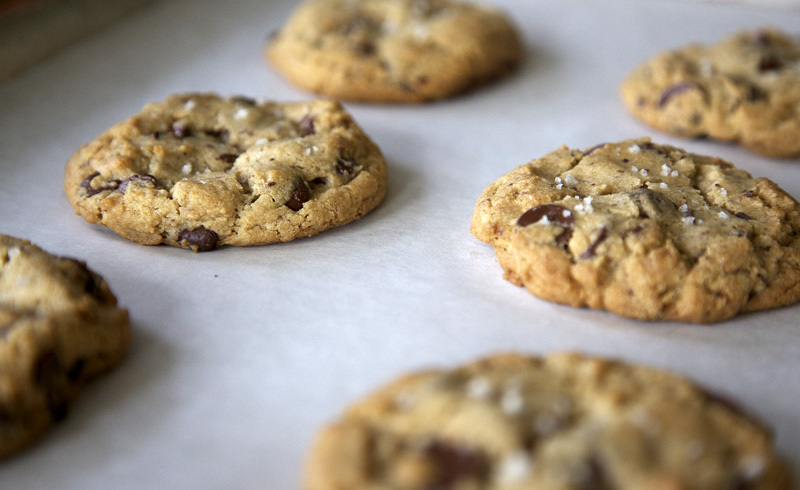 They're mostly about cookie goodness - not so much about tooth-aching sweet. 5. You put salt on top, which sounds weird, but is so wonderful. 6. They have an amazing complex, caramelized, sophisticated flavor. Really. 7. They have lots and lots of delicious chocolate pieces inside them. Each bite is like a fantastic chocolate circus in your mouth. Amazing, right? I know, tell me about it. Happy cookie making, cookie dough sneaking, and cookie nirvana eating. Notes: I think there are three things that this recipe really has going for it: 1) The combination of bread and cake flours. The texture of these cookies is awesome. Most cake flours are bleached, which means lots of processing and chemicals. I use King Arthur's brand of cake flour, which is unbleached. 2) Let the dough rest for at least 24 hours, as the recipe states. It's amazing the transformation the flavors take on. So worth it. 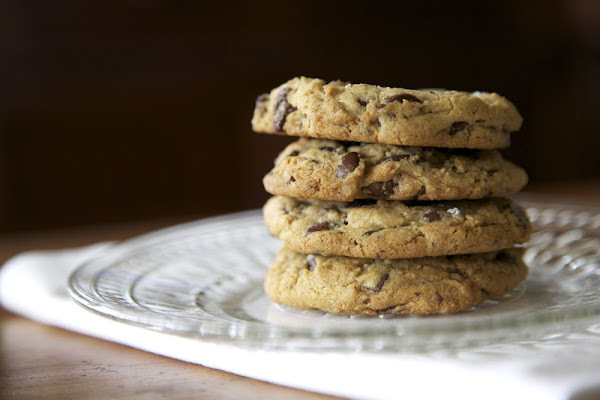 The resting allows the liquids in the dough to be absorbed, giving you a firmer dough that bakes up into thick, chewy, caramel-y, sophisticated cookies. And, 3) Please use some really good-quality chocolate here. I love Ghiradelli's 60% cacao bittersweet baking chips. They're find-able, affordable, and de-lish. I use about two cups of the chips as they are, and then I roughly chop the remaining 1/2 cup to distribute even more chocolate in each cookie. If you want to splurge, (oh man!) go for these. Or these. Oh, annnd also, sometimes I like to add about 2 cups of chopped, toasted walnuts or pecans. Your choice. Adapted from The New York Times, courtesy of this gentleman. Let's just call him the Chocolate Genius, shall we? We visited Steve's parents for a few days. On Sunday, we went to the cemetery to put flowers on the family graves. 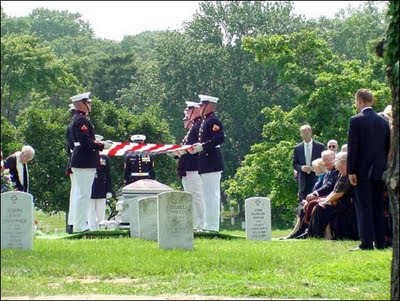 I have always liked the concept of Decoration Day, remembering and honoring loved ones who have died, but I had never actually decorated graves. The girls were very interested in it all. They have both been asking endless questions about long-dead relatives - Where is Granny's Mama? Who was Grandpa's grandpa? For Katherine, at least, a few details about our mysterious family tree may have been answered. Steve's mom had pots of gorgeous flowers for each grave. The girls were happy to help water them. We took pictures of 3 generations. Rachel was delighted to find her name on her great-great-great grandmother's stone. Our girls will never know their biological relatives, but at least we can give them stories and meaningful memories of our ancestors. It was hot much of the weekend - 106 one day! So we tried out our new hopscotch splash game. I'd say it was a hit! Time for Tuesdays with Dorie and I'm actually posting again -- I know, two TWD weeks in a row! 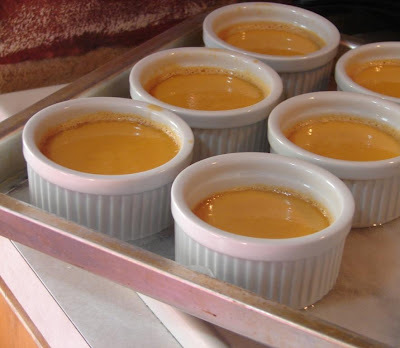 Trying to make a comeback here :) Our recipe of the week is for Caramel Pots de Creme, my second attempt making pots de creme (my first one was the chocolate version for TWD -- which turned out lovely). Thank you to Peggy from Peggy the Baker for this pick. The above photo is before baking, I covered mine in aluminum foil and had to bake for a little longer than the recipe called for, 20 minutes perhaps? It was a while after, but they just weren't setting up for me. 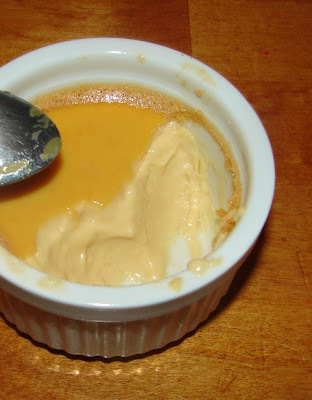 Anyway, they looked delicious, the caramel taste was nice, but they were just too custardy / eggy for me this time. I follow this blog sometimes http://sweetnothings04.blogspot.com/ and she had this poem posted in honor of mermorial day. To the men and women of our armed forces who have given the ultimate sacrifice, to their families, and to all of our troops still away from home. We love you. We honor you. And I will be raising my glass to you on Monday! Raise your hand if you like peanut butter. Ah, yes, I see. You all do. That's good. I do too. In fact, I really like peanut butter. I didn't always, though. You see, when I was little, the only thing "peanut butter" that I'd eat was Reese's Peanut Butter Cups. No PB & J sandwiches, no PB cookies, and certainly not a scoop right from the jar! The horror. Which brings us to today. I'm happy to report that I've made even more progress. (I feel like I'm reporting to some recovering addict group or something when I say that...) Though I don't find myself practicing restraint when a jar of peanut butter is near and I have a spoon in hand, I do like me some peanut butter. Preferably with a little oatmeal, flour, butter, and sugar. But that's the best way to have most things, wouldn't you agree? I think it would now be appropriate for me to share the recipe for Mom's Peanut Butter Chocolate Chip Cookies. But we have a problem, because I didn't make them. 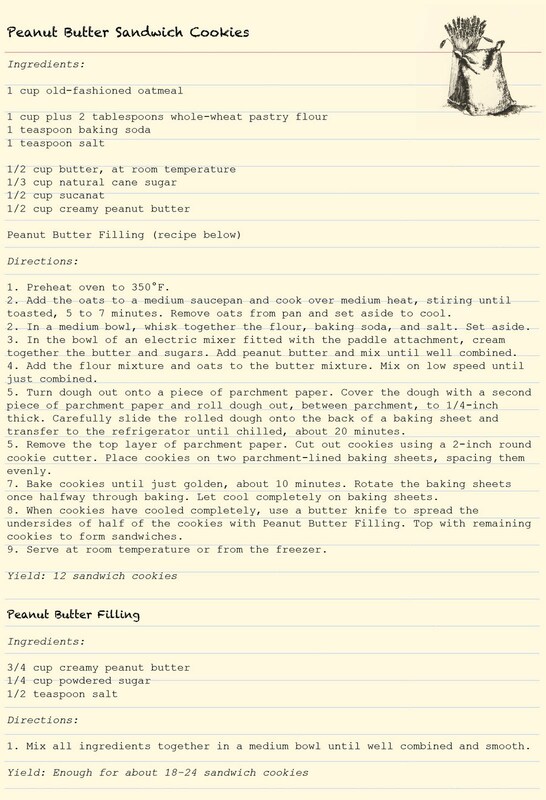 Soooo, I'll make them soon-ish and then you'll all see why they cured me of Peanut-Butter Hate. But for now, these little sandwich treats are amazing. 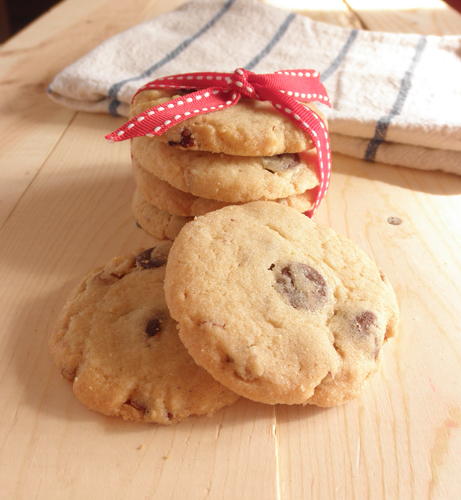 You're not receiving the short end of the stick by not getting Mom's cookie recipe today, I promise. I've made these little guys many, many times and they do not disappoint. 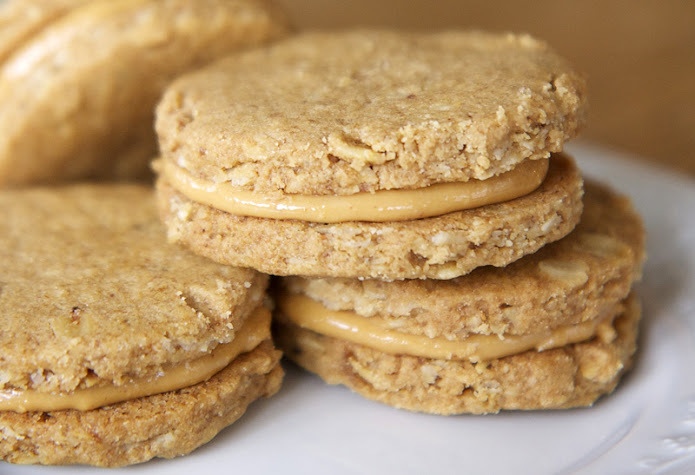 Consider them a more-refined version of peanut butter cookies. 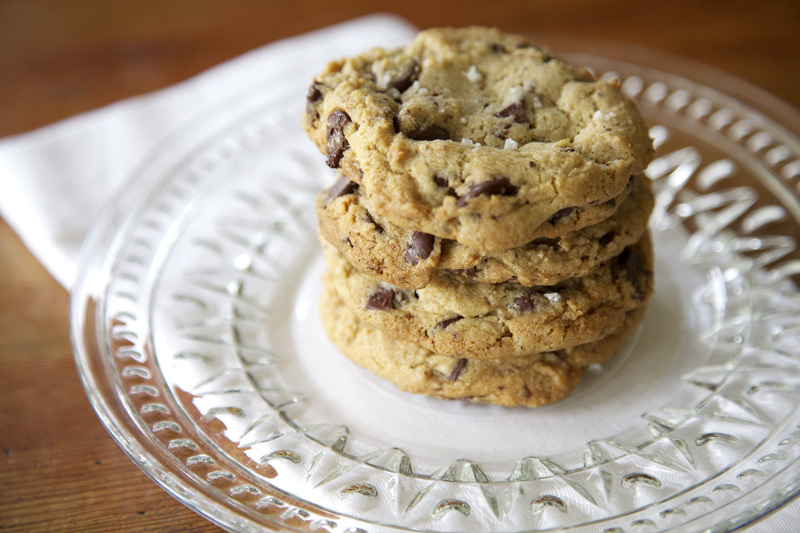 These cookies are delicate yet full of peanut butter flavor. 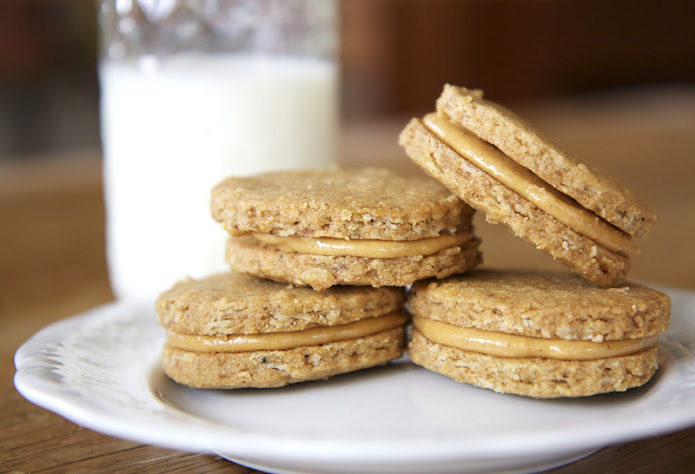 They are nutty and creamy and crumbly and they melt in your mouth like only a good peanut butter cookie can do. I don't really know what else to say about them except that they are SO good. And I really want you to make them because, as we have just established, we all love us some peanut butter, right? Notes: I've made my regular substitutions to the original recipe, but if you don't have whole-wheat pastry flour or sucanat, you can use all-purpose and brown sugar in their place. The filling recipe makes more than I've ever needed for one batch, but I suppose it all depends on how much filling you like in your cookies. 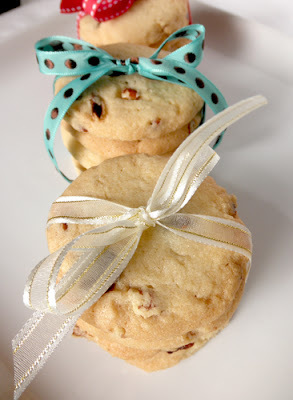 Try the whole recipe for the filling and if you have left-overs, hey, you've got an excuse to make more cookies, right? Also, I discovered that I prefer these straight from the freezer. They don't get rock-hard like most cookies do when you freeze them for some reason, they just get really good. How's that for vague? :) Of course, they're lovely at room-temperature, too. Enjoy! Today the girls and I headed up to Carlsbad for an afternoon of strawberry picking, it was great fun! Got our bucket and we're ready to get to pickin! Lola is very happy... but I will tell you she was much happier to be playing in the mud and not picking strawberries! Ellie had a strategy... one for the bucket, one to eat, one for the bucket, one to eat. soon enough it was just me picking berries while the girls hid between the aisle and played in the mud!! 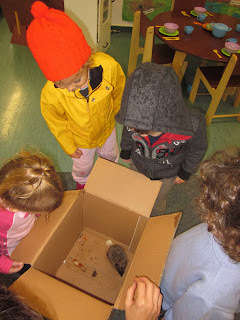 We did managed to fill up the bucket all while having a bunch of MESSY FUN! This recipe came from my food-pushing grandmother on my mom's side. Whenever we would visit her and Grandpa in their home in the hills of Santa Cruz, California, she would knock herself out day and night cooking and baking up tasty treats. I remember waking up in early in the morning to the sounds of Grandma clanking pots and pans and opening and closing the oven behind the wooden slider door that separated the kitchen from the living room where I slept on the sofa bed. I would lie cozy under the covers, staring at the sparkly popcorn ceiling, listening to those noises, smelling the warm scent of Parkerhouse rolls emanating from that kitchen, and I would feel welcomed and loved. I knew as soon as I stepped into that kitchen, Grandma would have a plateful of those rolls and a stick of butter waiting for me at the kitchen table. I would sit next to Grandpa in his easy chair, and watch the morning news as I ate as many of those tender brown-on-the-outside-yellow-on-the-inside rolls as I wanted to. God bless that woman for instilling in me a passion for baking as well as a passion for family. 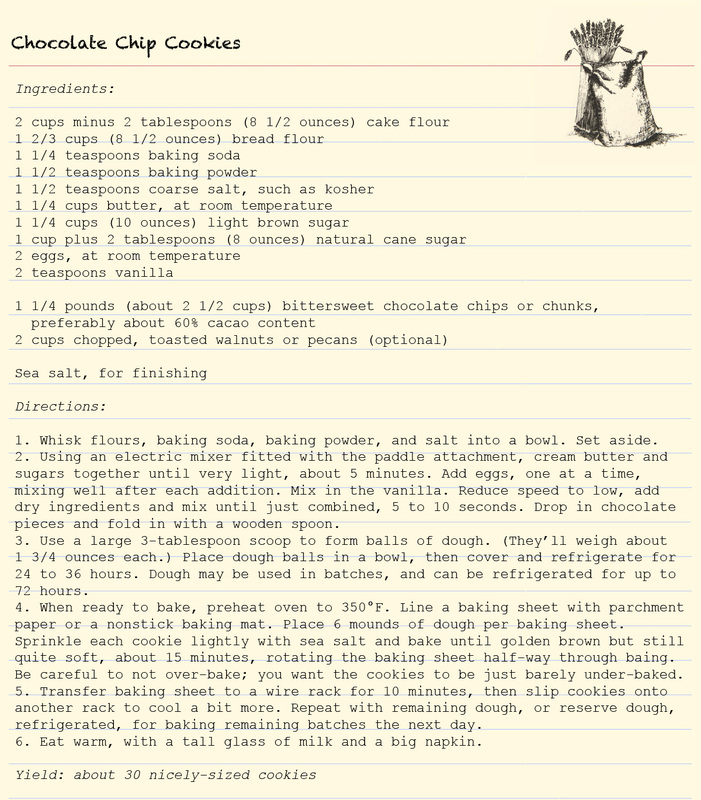 I'll have to post that Parkerhouse roll recipe soon, but for now, here is another of her love-filled recipes for a sweet treat that tastes deceptively light. 6. Move puffs to wire racks. Poke each one with a toothpick or a sharp knife to allow steam to escape. 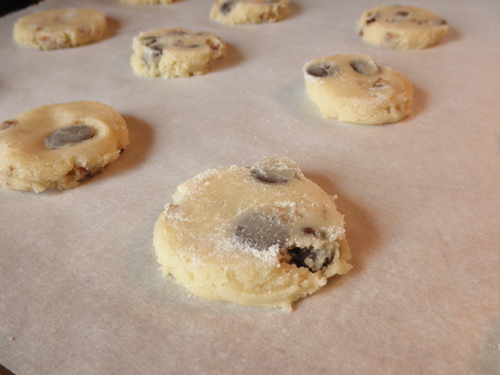 Once cool, cut each puff horizontally in the middle. 8. Pour the heavy cream into the chilled mixer bowl. Whip on high speed until almost stiff peaks form. Then fold pudding into whipped cream. 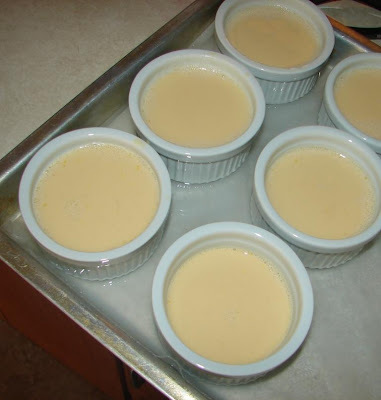 (Use 1/2 to all of the pudding, depending on how sweet you want your cream puffs to be.) Do not over-mix. Scrape about half of this mixture into a gallon size zip top bag. 9. Snip about 1/2 inch off the tip of the zip top bag. One puff at a time, open the top and squeeze in to fill the bottom, and top, if necessary, of the puff. Return top to its puff. 10. 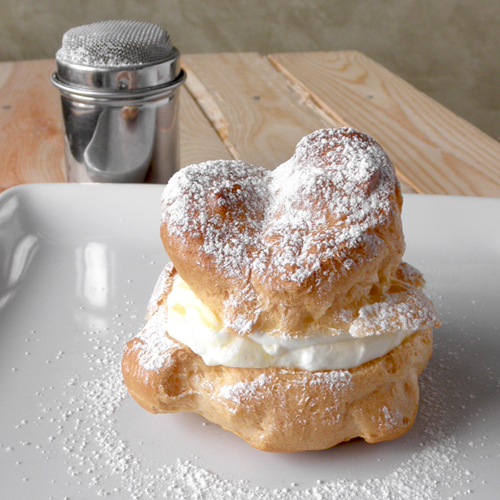 Plate puffs and sprinkle with powdered sugar. Oh my gosh! I was at the Johntson (Iowa) HyVee this afternoon and I had to take a photo of this cauliflower display. I haven't tried it yet, but I plan on getting some soon to put into my chicken egg rolls. 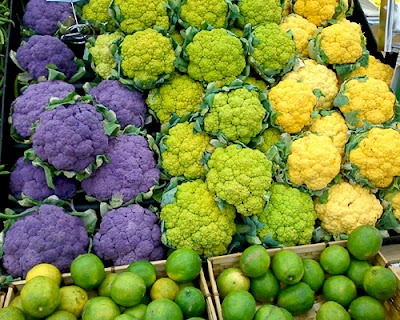 Apparently this purple cauliflower has the same antioxidants as red cabbage and red wine. Hmmmm... yet another way to counteract the unhealthy aspects of my egg rolls. More details to follow. This is a little video from Te Takoha, for his mum Emma who is in Australia at the moment. We hope you enjoy it Emma. Imagine how surprised we were today when a small hedgehog came scampering in, taking shelter under our veranda. After a couple of attempts to set our new friend free (he wasn't having it and kept returning) we very carefully gathered him up, placed him in a box and gave him a raw sausage to eat. When the afternoon children arrived it was a real treat to be able to show them what was in the box! 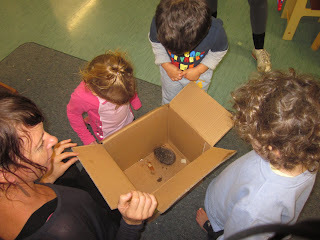 We were all absolutely amazed by the length of the hedgehogs back legs. 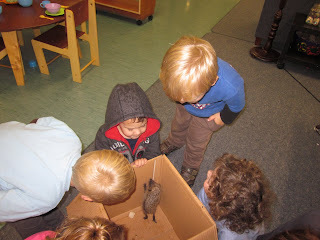 We spent along time looking at our visitor, noting the spines on its back, its soft tummy covered in a coarse grey-brown fur and its long whiskery snout. 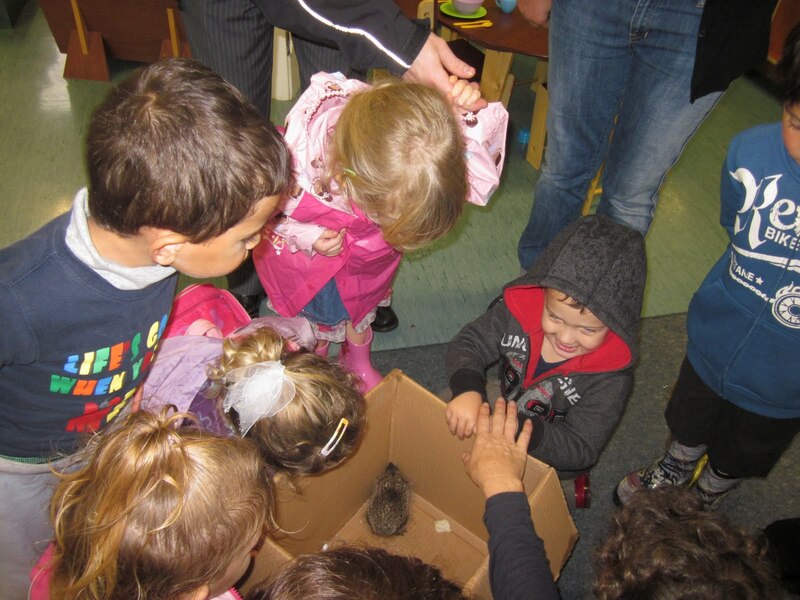 Eventually, after almost all the sausage had gone, we decided to try once again to release the hedgehog back into our Kindergarten garden. 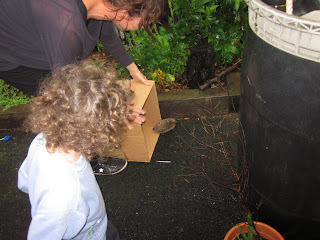 It was a little reluctant (perhaps it didn't like today's rain) - I wonder if it will visit us again? Our visitor was a great learning experience for us, we were able to discuss hedgehogs, their natural environment and see close up what they really look like. 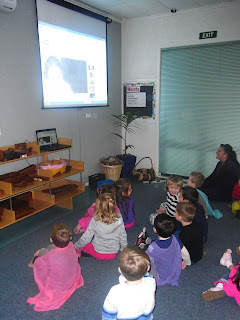 Sheridan arrived at Kindergarten this morning and told us she was on 'You Tube' singing one of Mairtown Kindergarten's favourite songs - Tutira mai nga iwi. 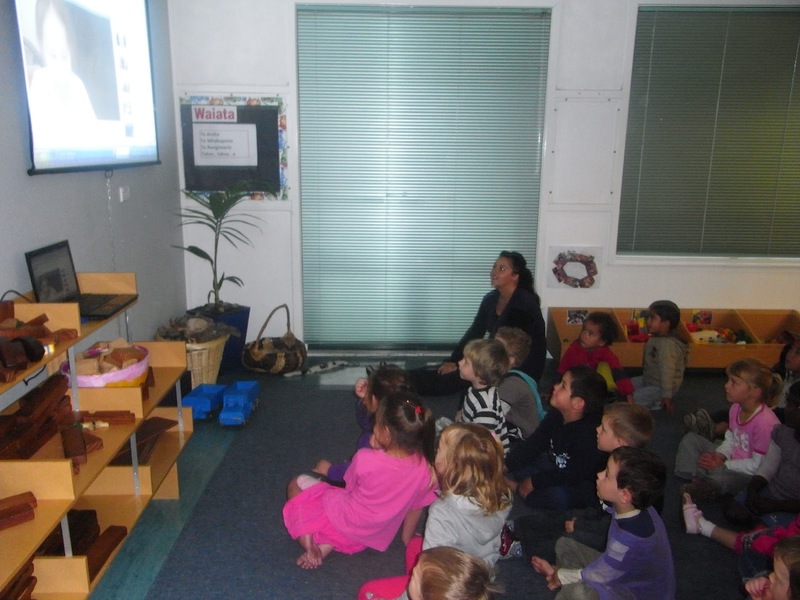 We were so impressed to see Sheridan singing this song at home, we watched it together on our new projector at group time. Everyone really enjoyed it, in fact we loved it so much we played it twice and even sung along with it. Well done Sheridan, we are all so proud of you. We've been munching on crisp spinach leaves for several weeks now. The earthy, fresh flavor of just-harvested greens is hard to beat. 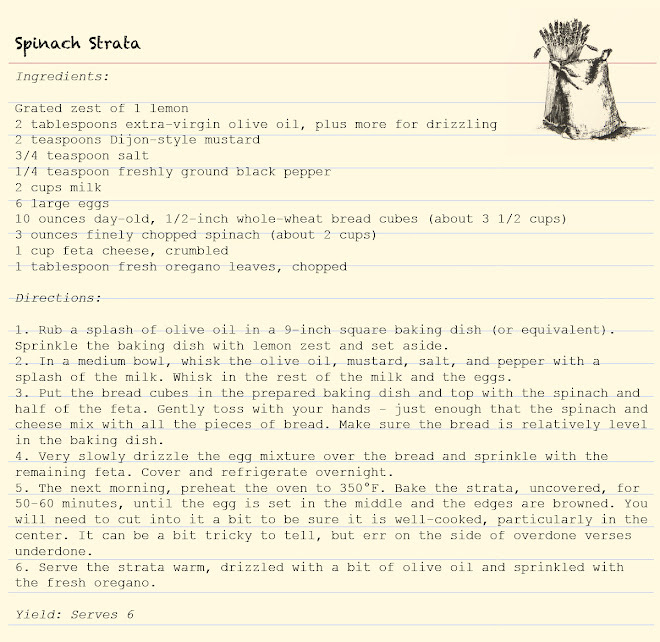 To me, spinach + olive oil + lemon is a trio made in heaven. At dinner, I love the leaves dressed simply - with a drizzle of olive oil and a squeeze of fresh lemon. But at breakfast, fresh spinach decorated throughout a rustic strata and combined with a bit of feta and oregano is the perfect way to start the day. 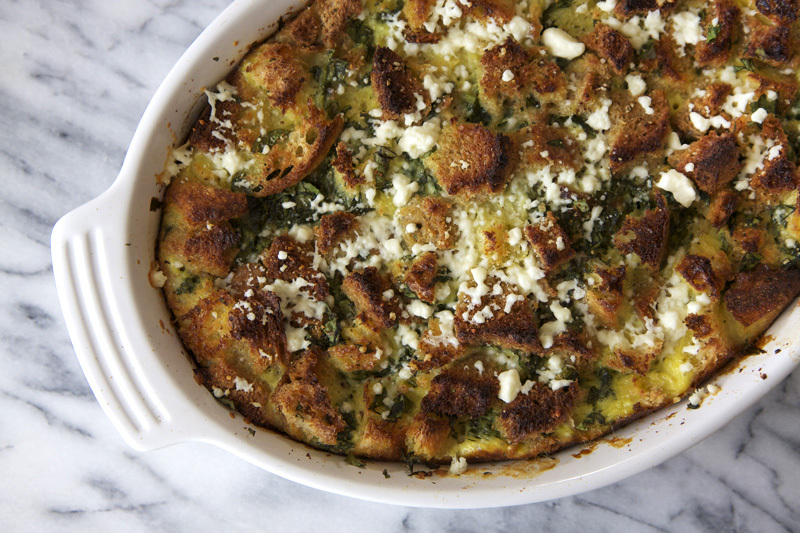 I have been making this strata almost weekly since I first discovered it. It is hearty, moist, and extremely flavorful. The top gets nice and brown in the oven, creating a lovely crunch. I admit, I've been guilty of stealing extra crispy bits to put on my breakfast plate. 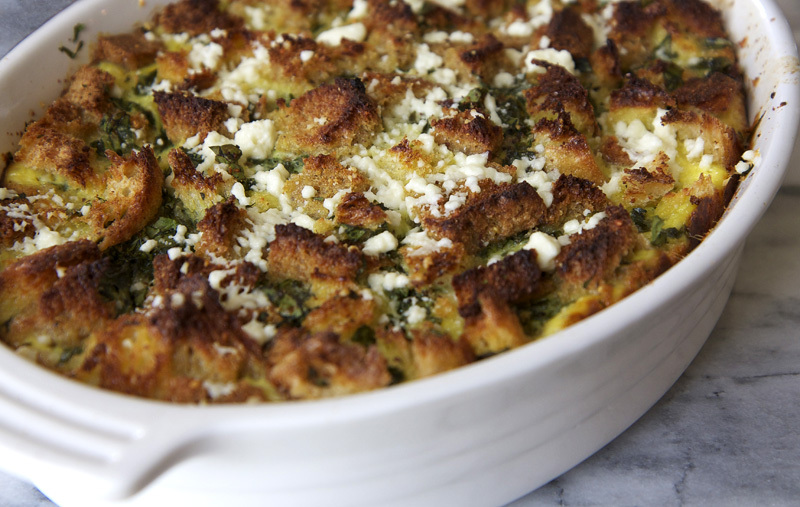 With the subtle, light taste of lemon, a bit of olive oil fruitiness, and a little saltiness from the feta, this strata is wonderful. I might also add that it is a snap to mix up. You put it all together the night before you want to serve it, and then bake it in the morning. I think this strata is a perfect way to use some of the abundant spinach out back. Dad agrees. Notes: I've increased the bread quantity slightly because I found the strata a bit wet with just the 8 ounces originally called for. If you don't have day-old bread, you can dry fresh bread in an oven heated to 250°F for 10 to 15 minutes. I've been making this with regular homemade whole-wheat sandwich bread, but any dense whole-grain bread will do. Rachel asked me to trace her hands today. She likes to do this and can't do it herself - she can trace her "little" hand but not her more useful hand. After I finished Rae admired the outlines, especially the left one. "My little hand!" she crowed and then kissed it. In the long years waiting for Rachel I used to adoption blogs and Waiting Child lists looking for someone who could be my child. I was always drawn to children with missing forearms or unusual hands. 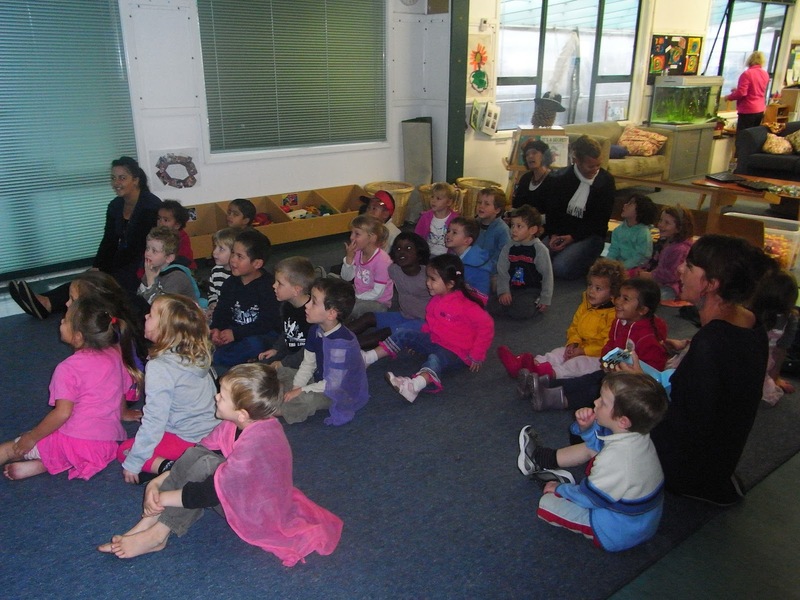 I had never heard of the term "limb difference", but I was intrigued by these children. So when we finally got Rachel's referral her special need seemed a perfect fit for us. 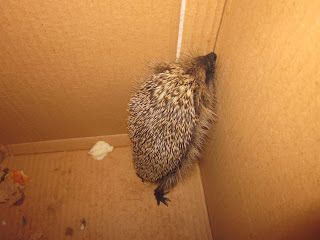 We had a vague idea that some things would be difficult or maybe even impossible for her to do indepentently, but none of that really concerned us. We were sure she would be just fine. And she is. A week or two after we'd heard about Rae, I was sitting in my classroom cutting out handprints for one of the endless preschool art projects featuring hands. I have always loved handprint art, but my concept of hands had suddenly changed. I wondered how we would handle projects like this with a child with only one typical hand. Would we use only her right hand? Use both hands, even if the results were not at all symmetrical and most obviously different? Avoid handprint projects all together? I leaned toward using both hands as they were, but was that too in-your-face? Would Rachel be bothered by her hands not matching everyone else's? I just didn't know. Once Rachel came home, we didn't have time to ponder the implications of handprint art, but we did find ourselves learning to love her "little" hand. No, it doesn't work the same way her right hand does, but it is very useful in it's own way. In fact, it is amazing what that hand can do. She uses both hands to do pretty much everything any other kid does and then some. And her little hand does things that no other hand can do. It's a formidable weapon when pressed into someone's arm or leg or neck. It is the perfect spot to store stickers until you need them. It works well for carrying an extra roll of toilet paper. It it is perfectly delightlful to kiss or pretend to nibble in the little fingers. Rachel's hand is a part of her so we love it as much as we love her eyes or chubby legs or laugh. I still hadn't resolved the handprint issue when Rachel went off to preschool. In fact, I'd pretty much forgotten that earlier internal debate about it. But when Rae brought home her first handprint project (a reindeer with one glorious antler and one stubby nub) I laughed out loud. Her teachers have also learned to celebrate her hands. And I love them for it. Rachel's handprint projects are instantly recognizable as hers. In December, Rachel brought home a Christmas present for us. It was a little tray to hold milk and cookies for Santa. On it is a Santa with his long fingerprint beard. And then there is a very short, stubby, but impossible cute angel. It's a little hard to see, but here she is. More handprint projects have come home and I love them all. This penguin was especially nice. But I think my favorite of all was her Mother's Day gift. Don't you love that little green bud? These are possibly the best flowers I have ever received. And Rachel was SO proud of her gift. She brought the present to me and announced "Here Mama, for YOU!" I thanked her profusely and set them on the kitchen table. The next time she passed through she picked up the flowers and brought them to me again. "Here Mama, for YOU!" I was presented that bouquet a dozen different times! I don't know what Rachel will think about her hands in the future. Right now, she is quite pleased with her little hand and admires it with great affection. I hope that never changes, though it probably will. For now I'll just look forward to the next handprint project and savor her beautiful hands.